Robert Gordon University has defended its decision to award an honorary degree to an oil boss who resigned from BP after one of the biggest spills in history. The university told STV Tony Hayward was "a role model" who had "made a huge contribution to the oil and gas industry" as it made him a Doctor of Technology. 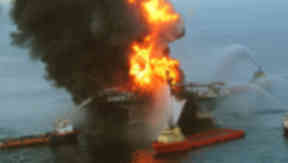 Dr Hayward resigned as CEO of BP in the wake of the Gulf of Mexico oil spill in 2010. The disaster was the worst offshore oil spill ever seen in the United States. Eleven people died in the initial accident and a massive fire burned for 36 hours before the Deepwater Horizon rig sank. The following days and weeks saw more than four million barrels of oil spew into the Gulf, according to US government estimates. It led to a state of emergency in Louisiana and prompted US president Barack Obama to halt all offshore drilling. The disaster also wiped almost £50bn off BP’s share price. Three years later compensation is still being paid to those affected and BP says it has spent more than £16bn so far in clean up and restoration costs. Students at the university expressed their anger at the award. Incoming Student President Paul Greene said they would be "very disappointed" at the news. He said: "As a student movement we need to ensure that universities have a responsibility to society. Giving a degree to people who have an environmental record like this isn’t conductive to that responsibility." And environmental groups branded the move "a sick joke." Dr Richard Dixon, Director of Friends of the Earth Scotland, said: "Robert Gordon University have made a very serious error of judgement with this award which sends exactly the wrong message to current and future students. Tony Hayward presided over the world's largest oil spill but continually played down its significance and trivialised the deaths of 11 people." The degree announcement comes just days after an expert panel told the US Congress they might struggle to put a final cost on the disaster. A few months ago Dr Hayward was heckled and shouted down by students at Birmingham University. They accused BP of actively lobbying in the run-up to the war in Iraq.